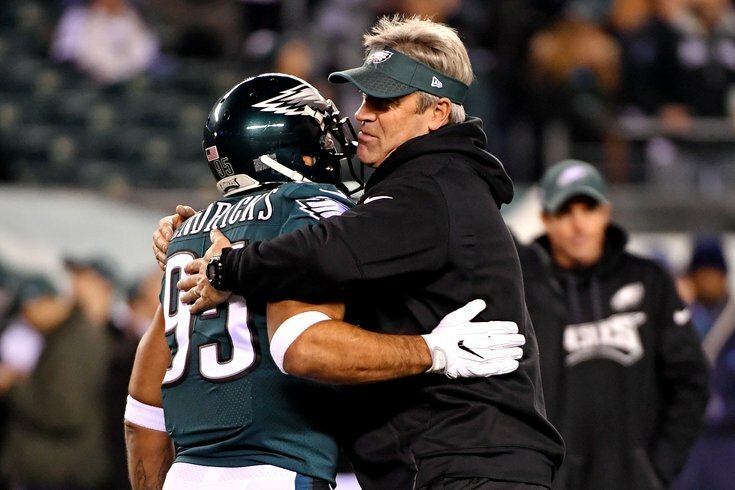 Mychal Kendricks and Doug Pederson hug it out. The Philadelphia Eagles kicked off their first OTA practice on Tuesday, and a bunch of stuff happened unexpectedly. Carson Wentz practiced, Mychal Kendricks got released, Paul Worrilow tore his ACL, Brian Dawkins left the team, and it was revealed that the Eagles turned down a decent offer for Nick Foles. Got questions or comments? Jimmy Kempski has you covered on whatever may be on your mind about the Birds. What does Kendricks' release and the loss of Worrilow mean for the Eagles' linebacker corps? Can we expect Carson Wentz to be ready for Week 1 of the season? Would the Eagles have sent Foles to Cleveland if Foles told the Eagles he was willing to go? MORE: Eagles 2018 locker room seating chart | Eagles reportedly turned down reasonable trade offer from Browns for Nick Foles | Report: Eagles release LB Mychal Kendricks | Report: LB Paul Worrilow tears ACL | Eagles OTA observations: Carson Wentz practices!